By Josh Saul My wife and I recently returned from a 2 week trip to the eastern Indonesia island of Irian Jaya, also known as West Papau Travelling from New York City, we desired a once in a lifetime experience in a remote part of the world and Irian Jaya did not disappoint. To preface this report, I want to say that this is an extremely remote location, and you should consider yourself lucky to find ANY western accommodations in this region. 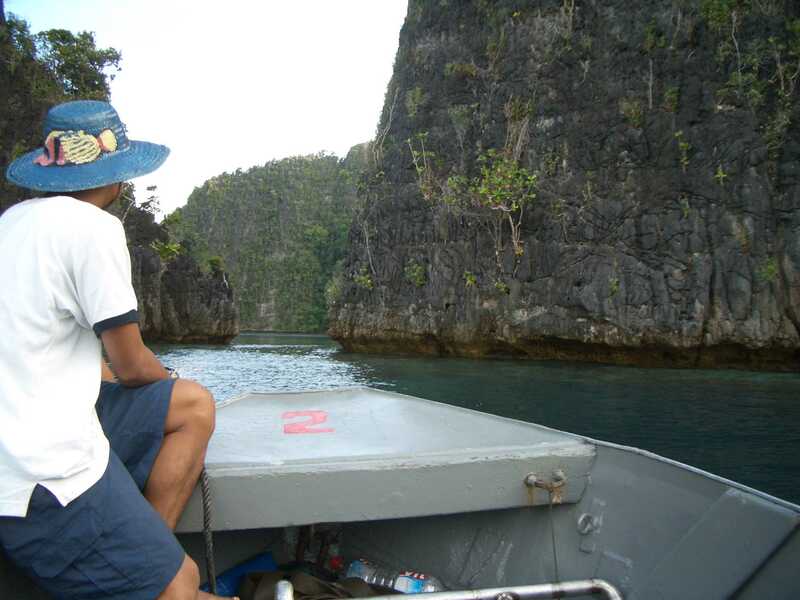 The Kararu liveaboard dive boat provides the best option for exploring this region in any type of luxury, but if you are considering a liveaboard, you have probably already given up on the idea of being pampered like a stay at a fancy resort. This trip is not for the faint of heart. 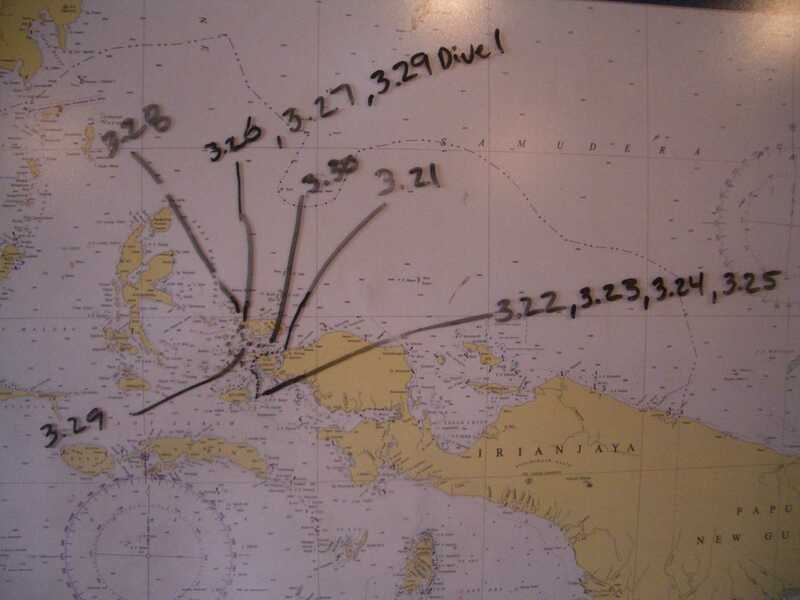 You have to be a bit crazy to do this much traveling to scuba dive– 4 days of traveling for 10 days of diving may seem like a bit much, but in our opinion it was worth it. I had never previously dove in the Asia-Pacific region, so the chance to go to virgin pristine reefs that were far removed from the regular tourist destinations was the right choice. I should mention that I am a bit of a coral nut (having a salt water aquarium at home helps). When I found out that they didn’t have a copy of Corals of the World on board the boat, I decided to bring my own copy. These three books are about 15 pounds by themselves and took up a third of my clothing bag. That’s either dedication to a hobby, a touch of insanity, or a bit of self-inflicted torture–take your pick. Manado – Sorong: 90 minutes The flight from Manado to Sorong was on Lion Air and their schedule was not available until the month before the trip. We left this final leg of the journey to the Kararu office, and as it turns out, everyone on the boat was booked on the same flight. This was the only flight where our baggage was over the limit, and Kararu charged us $4/kg for the added weight. I think the weight allowance was something like 30kg per person, but I might be wrong about this. 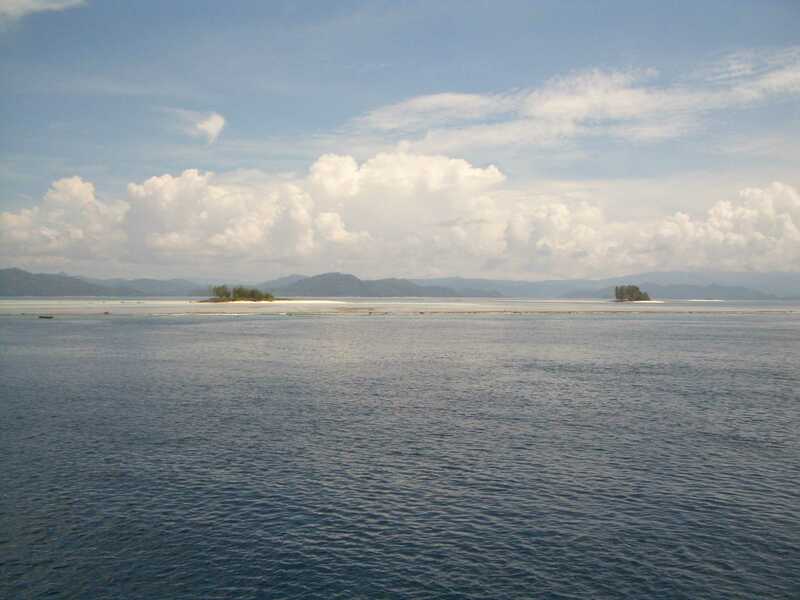 The Kararu office recommended that we do not overnight in Sorong, and after seeing it in person, I tend to agree. Sorong is a remote port town, and extreme poverty surrounds you from the moment you land. Their recommendation was to spend 2 nights at the Santika Hotel in Manado, which was actually an oasis of a western resort compared to the rest of the island. However, it is still deep in the jungle and some services are limited (Internet is dial up and didn’t work 50% of the time, the “fitness center” is a bike one exercise device). Most of the staff didn’t speak English very well, so you have to make sure you speak to the right people when ordering food or drinks. The Santika is a good 45 minute drive from the airport. There is a shuttle service provided by the hotel, quite an adventure unto itself. The bus is actually an airport shuttle not designed for the long drive or difficult roads we had to follow. At certain points the bus seemed like it was not going to make it up steep hills, and we noticed that the driver turned off the air conditioning when going into steep embankments. On the return ride at the tail end of our trip, the air conditioning was broken, causing everyone on board to experience probably the most miserable ride of their lives. It was so steamy that they had to continuously wipe down the windshield from all the humidity. The Boat The Sea Safari III is a HUGE boat. 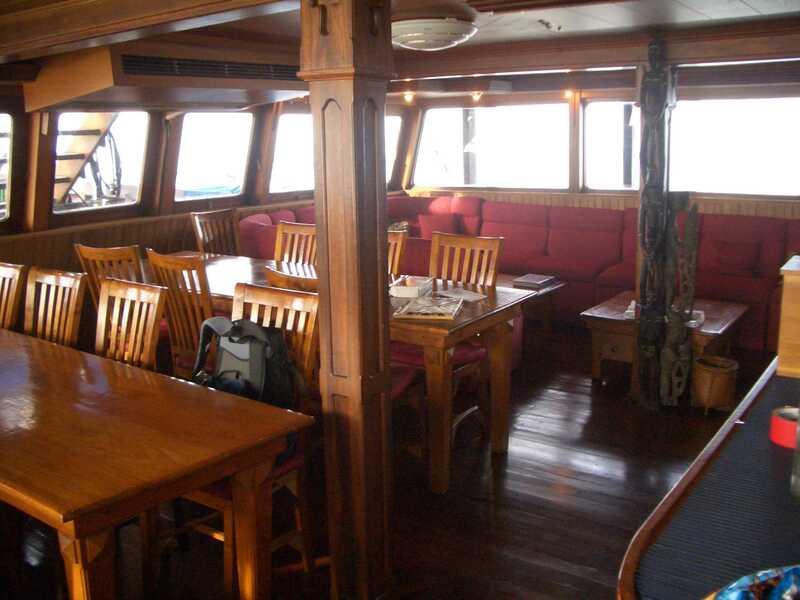 It is apparently 40+ meters in length, but twice as wide as any other liveaboard I have seen. There are a lot of places to relax in solitude. The upper deck is a bit crowded with all the deck chairs, but generally the best place to sun. It would get extremely hot during the afternoons and I found that I burned my feet coming down the stairwell. The dive deck has a few problems. First of all, the wetsuit area is a little crowded with hangers. Also, the personal storage area is difficult to open when your equipment is above it. 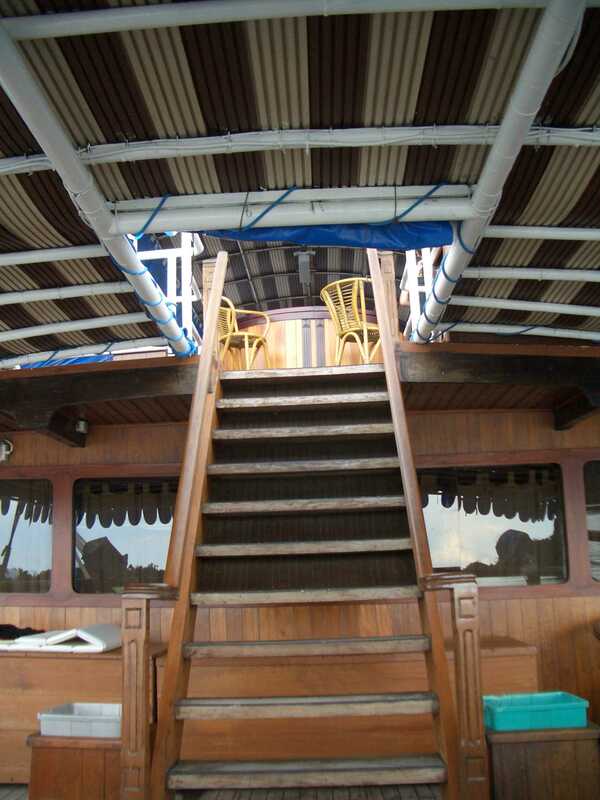 The boat is teak with wood built-ins everywhere. This causes a soft creaking sound when the boat is moving. On one night, in fairly rough water (we were anchored in a wild patch of water) the creaking was so loud that we couldn’t even watch Kill Bill on the TV without having the volume at its loudest setting. , Big Breakfast – choose from eggs, pancakes, French toast, fried noodles, noodle soup, fried rice, etc. This was prepared during the first dive of the day and ready when everyone returned to the boat. Lunch – Fresh rolls, cold cut platter, large fresh salad, a mixed vegetable dish (local recipes), a plate of satay (chicken or tuna) and fruit. The fruit included exotics like “snake fruit” and mangostines, the later were so popular that people were generally disappointed when we ran out after the 4th day. Banded coral snake – I think this one was trying to mate with my regulator. Very inquisitive and curious. and about 200 different species of nudibranchs. I looked all over for a blue ringed octopus, but didn’t get a chance to see one. Another diver reported a sighting though. The water temperature ranged from 78-84. At one point, our dive computer said 94F, but I think that was just a current blowing down from shallow water. I wore a 3m shorty wetsuit for the entire trip and never gave a thought to body temperature. Other people were diving with skinsuits or a sleeveless top and a hood. Visibility was a bit disappointing. I didn’t record any of the estimates, but it is safe to say that there were no days with 100+. Most dives ranged from 30-50’. The strong current in some areas were really a blessing, as the Sinularias, Nepthias, and Dendronepthea went absolutely wild and showed full expansion. One wall dive in the Misool area was completely covered with bright yellow and orange soft coral. Each location seemed to have a different dominant species, some dives were Dendronepthea, some dives were Sarcophytons (a few as large as a lazy boy recliner), and a large number of dives were hard coral centric. On every dive you could find nice large Euphyllias, huge areas of Goniaporas, and mammoth table Acroporas. If you had a preference for soft coral vs. hard coral, it really was just a matter of going to the right depth, as there was a good selection of everything at each site. Me? I had a preference for dense fields of hard coral with scattered anemones. Tough request huh? Not in Irian Jaya! I could find these underground majesties each day, usually in about 30-40’ of water. 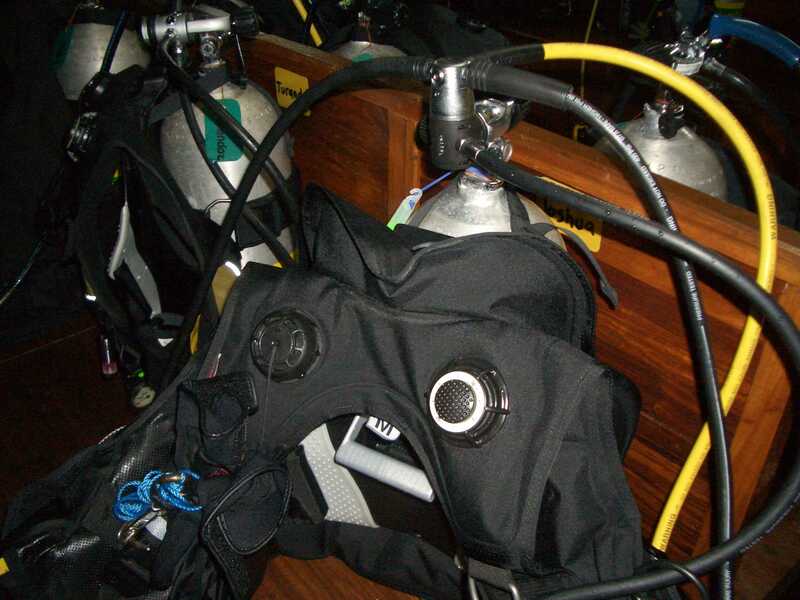 At that depth, you can stay down for about 75-90 minutes on Enriched Air Nitrox (a special oxygen enriched blend of air used by advanced divers to increase their bottom time and decrease the effects of nitrogen on the body). The only reason to return to the surface was if you were tired or getting cold. This trip took several months of planning, but it was worth every minute. Having dived in many extreme corners of the world, I can safely say that this is the best reef diving in the entire world. As more people become aware of this unique location, and the dive operators have developed their programs, ordered better boats, and have begun to map the hundreds of hidden locations, each dive could be the best dive of your life.